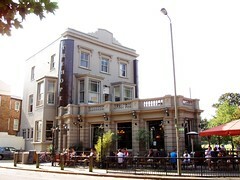 Castle Mitchells & Butlers pub on the edge of Wandsworth Common. It's a decent place for a drink, and also does good food (from the same menu as other Metro Professionals pubs such as the Ranelagh and the Crown). Inside is a large space over several levels, with a bar up some steps at the back of the room next to the kitchen. There are also plenty of outdoor tables around the front of the pub, looking out onto the busy street and the Common itself. There are five handpulls, three with ales (Old Speckled Hen, London Pride and Brains SA) and two with ciders (Weston's Vintage and Old Rosie) on a September 2008 visit. They also have plenty of lagers (Pilsner Urquell, Meantime London Pale Ale, Staropramen, Peroni, Hoegaarden, Leffe, Erdinger, Applebocq, et al.). Service seems perfectly friendly. On a sunny Sunday lunchtime visit in September 2008, the place was quite busy, but there were still tables available inside. Ewan tried the vegetarian option for the Sunday roast, a vegetable and chipotle pesto pie which was broken over some lightly roasted potatoes, plenty of green beans and shallots (£9). A chunk of Yorkshire pudding was on the side, with a not too heavy serving of gravy photo. It was served quite speedily, but was still very tasty, with some lovely flavours to the pie, and a slight pleasant hotness. Other options for the roast are beef and lamb, as well as a pork variant. There were five other mains at around £7-8 each, two of them vegetarian, and other light dishes. Puddings were decently priced at £3.50. Food is served noon-10pm Monday to Friday, 11am-10pm Saturday and noon-9pm Sunday. Brunch is served on Saturdays from 11am-02:00pm, and the Sunday roasts are served from noon until they run out. Accessibility: As mentioned, even on the ground floor, there are plenty of stairs all over the place at this pub, and the toilets are upstairs. Last visited by Ewan, 21 September 2008. Opening hours taken from the Hope website, April 2012. Food times provided by an anonymous visitor, April 2012. Last edited 2013-06-06 12:36:13 (version 15; diff). List all versions. Page last edited 2013-06-06 12:36:13 (version 15).